This summer I had the opportunity to create a custom painting for the beautiful Mila + Paige fashion boutique in New West. It's 48" x 48" and was a lot of fun to bring to life. 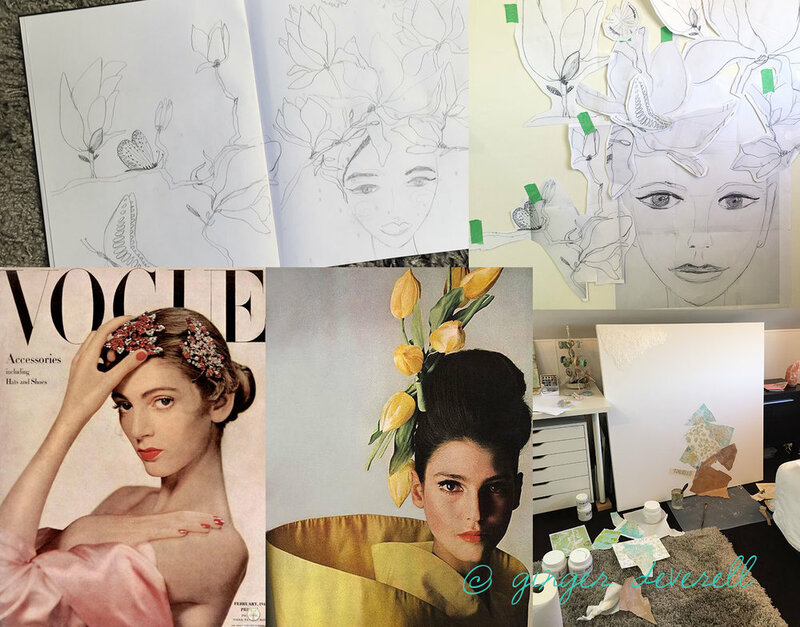 I started with sketches based on our talks of what the owner loves, and lots of browsing Pinterest for faces and flower inspiration. I used prints of my own surface pattern designs to collage the face, and built on many layers from there using paint, ink, ribbon and jewelry embellishments. I thought you might be interested to see inside my process so I'm sharing a few pictures. Thank you Anita at Mila + Paige for loving my style and commissioning me to do this special piece for your shop. It was a real pleasure. Visit Mila + Paige at 45 Sixth Street in New Westminster, BC.